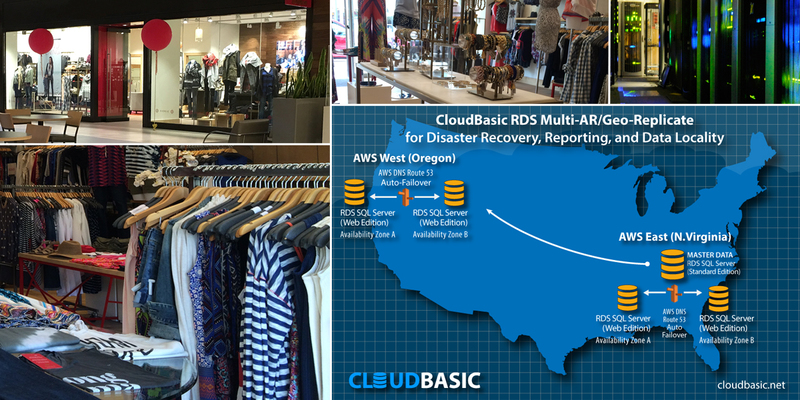 Fast growing fashion retailer migrates to the cloud and lowers TCO with CloudBasic. EXECUTIVE SUMMARY: A fast growing fashion retailer, specializing in maternity wear, with over 50 stores nationwide and a strong ecommerce operation, needed to migrate its SQL Databases from an on-premise location to AWS. Initially, the company was planning to utilize Amazon’s RDS Multi-AZ for SQL Server. However, the IT team realized that Multi-AZ does not support cross-region replication, mirrored instances are NOT Readable-Replicas and cannot be used as Read- Replicas for reporting, and SQL Web Edition is not supported for Multi-AZ. The client used a CloudBasic solution not only to overcome these limitations, but also to drastically lower TCO. The client is a fast growing fashion retailer, specializing in maternity wear, with over 50 stores nationwide and a strong eCommerce operation. 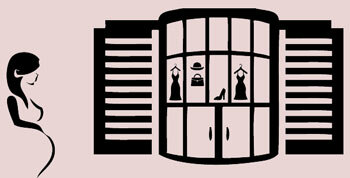 The company started as a small boutique clothing store in the Midwest, specializing in maternity wear. It quickly became popular with young mothers because of its fun environment, super friendly staff, and the unique styling experience. With profound respect for mothers deeply embedded into the company’s culture, the brand delivered a consistent WOW when it comes to moms’ look and feel. The founder, who drew inspiration from her own motherhood experience not too long ago, must have done something right. Within only a decade, the little boutique transformed into a nationwide multi-million dollar brand, catering not only to young moms, but to mothers in all stages of life. As more and more brick and mortar stores appeared at popular location throughout the land, a strong eCommerce division helped take the bottom line to new heights. The IT Infrastructure of the company had to keep up with the fast growth of the business. Initially, with only a few stores in the same state, a local datacenter was sufficient to support the retail operation. However, as the company expanded nationwide, and into eCommerce, it became necessary to migrate the on-premise SQL Servers to the cloud. AWS, as the leading public cloud provider, was a natural choice. Migration to the cloud usually requires companies to re-design their IT infrastructure. This is also the best time to catch up with the latest trends in security and efficiency, and implement best practices for Disaster Recovery. 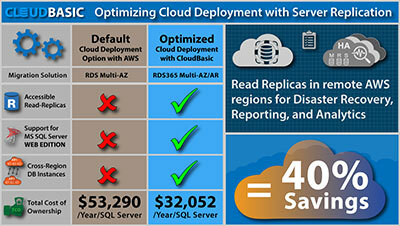 The client team was planning to utilize Amazon’s RDS Multi-AZ for SQL Server. They were particularly fond of the Multi-AZ deployments, where Amazon RDS automatically creates a primary DB Instance and synchronously replicates it to a standby instance. Sounds like a perfect setup for disaster recovery, where the team could use the mirrored standby instance of the database as a Read-Replica for reporting and analytics purposes, a must have feature. But there was the challenge. Multi-AZ creates replicas within same AWS region only (no cross-region replication), mirrored instance is NOT a Readable-Replica, and SQL Server Web Edition is not supported for Multi-AZ. The most practical approach was to go with the cost-effective RDS Singe-AZ SQL Web Edition and CloudBasic’s RDS Multi-AR/Geo-Replicate for SQL Server Web Edition. Not only that it is 1/2 less expensive alternative to RDS Multi-AZ SQL Standard, but also CLOUDBASIC RDS Multi-AR was the only option to allow reporting against a Read-Replica of the primary RDS. The company also deployed CloudBasic’s RDS Multi-AR in another region for Data-Locality and Disaster Recovery as well. Both creating Read-Replicas & creating them in another region are not supported by Amazon’s RDS Multi-AZ. With solutions from CloudBasic, the client was able to implement an efficient migration from on-premise to AWS, and avoiding overpaying for products and functionality that did not serve the purposes of the company. Rather than deploying AWS’s RDS Multi-AZ SQL Standard, db.r3.2xlarge for the DR part of the solution, and pay over $53,290/year/SQL Server, the company deployed Amazon’s “RDS Single-AZ, db.r3.2xlarge SQL Web Edition” along with CloudBasic’s “RDS Multi-AR/Geo-Replicate for SQL Web Edition” (which supports both Read-Replicas for reporting and Data Locality and DR), lowering TCO to only $32,052/year/SQL Server. This is a staggering saving, with support of cross-region mirroring for Data-Locality, Reporting and DR, all at the same time. For more information see Multi-AZ vs Multi-AR comparison table at https://cloudbasic.net/aws/rds/alwayson/aws-multi-az-vs-cloudbasic-multi-az-ar/. Leverage the cloud at its best! 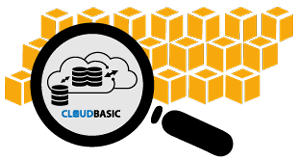 To learn more about CloudBasic and its cloud technology products and services, please contact CloudBasic.